Peggy's Cove is a small rural community located on the eastern shore of St. Margarets Bay in Nova Scotia's Halifax Regional Municipality, which is the site of Peggys Point Lighthouse (established 1868). 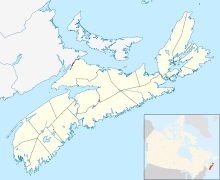 Peggy's Cove is 43 kilometers (26 miles) southwest of Downtown Halifax and comprises one of the numerous small fishing communities located around the perimeter of the Chebucto Peninsula. The community is named after the cove of the same name, a name also shared with Peggy's Point, immediately to the east of the cove. The village marks the eastern point of the St. Margaret's Bay. The first recorded name of the cove was Eastern Point Harbour or Peggs Harbour in 1766. The village is likely named after Saint Margaret's Bay (Peggy being the nickname for Margaret), which Samuel de Champlain named after his mother Marguerite. There has been much folklore created to explain the name. One story suggests the village may have been named after the wife of an early settler. The popular legend claims that the name came from the sole survivor of a shipwreck at Halibut Rock near the cove. Artist and resident William deGarthe said she was a young woman while others claim she was a little girl too young to remember her name and the family who adopted her called her Peggy. The young shipwreck survivor married a resident of the cove in 1800 and became known as "Peggy of the Cove", attracting visitors from around the bay who eventually named the village Peggy's Cove, after her nickname. The village was founded in 1811 when the Province of Nova Scotia issued a land grant of more than 800 acres (320 ha) to six families of German descent. The settlers relied on fishing as the mainstay of their economy but also farmed where the soil was fertile. They used surrounding lands to pasture cattle. In the early 1900s the population peaked at about 300. The community supported a schoolhouse, church, general store, lobster cannery and boats of all sizes that were nestled in the cove. Many artists and photographers flocked to Peggy's Cove. As roads improved, the number of tourists increased. 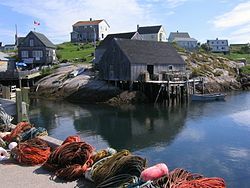 Today the population is smaller but Peggy's Cove remains an active fishing village and a favourite tourist destination. Roads and several homes were badly damaged at Peggy's Cove in 2003 by the extensive flooding that accompanied Hurricane Juan, which also damaged the cove's breakwater. The breakwater was further washed away by Hurricane Bill in 2009, allowing waves to seriously damage a home and gift shop, and washed away one of the cove's characteristic wooden fish sheds. From its inception, the community's economy revolved around fishery. However, tourism began to overtake fishing in economic importance following the Second World War. Today, Peggy's Cove is a major tourist attraction, although its inhabitants still fish for lobster, and the community maintains a rustic undeveloped appearance. The regional municipality and the provincial government have strict land-use regulations in the vicinity of Peggy's Cove, with most property development being prohibited. Similarly there are restrictions on who can live in the community to prevent inflation of property values for year-round residents. The historic Carpenter Gothic style St. John's Anglican Church, the only church in Peggy's Cove, is a municipally designated heritage site. The first public art gallery, tea-room, and gift shop was opened in a shack in Peggy's Cove in 1937. View of Peggy's Cove from The Whalesback, 1 km north of the community. St. Margaret's Bay is to the right, the Atlantic Ocean straight ahead. More than 400 million years ago, in the Devonian Period, the plate tectonics movement of the Earth's crust allowed molten material to bubble up from the Earth's interior. This formed the rocks seen today and are part of the Great Nova Scotia batholith. The landscape of Peggy's Cove and surrounding areas was subsequently carved by the migration of glaciers and the ocean tides. About 20,000 years ago, an ice ridge moved south from Canada's Arctic region covering much of North America. Along with the ebb and flow of the glaciers, the ice ridge eventually melted and shifted and in the process scooped away and scoured large sections of rock, vegetation and topsoil. As melted land glaciers flowed back to the oceans the changing tidal flows and rising sea levels filled the scarred areas with water, forming coves and inlets. Large boulders composed of 415-million-year-old Devonian granite, called glacial erratics, were lifted by the ice and carried for long distances before being deposited upon the landscape as the ice receded, leaving rugged barrens. The movement of the glacial ice and rocks left scouring marks in the bedrock that are still visible. Peggy's Cove has been declared a preservation area to protect its rugged beauty. The Peggy's Cove Commission Act, passed in 1962, prohibits development in and around the surrounding village and restricts development within Peggy's Cove. The area comprised about 2,000 acres (8.1 km2) stretching from Indian Harbour to West Dover and includes barrens, bogs, inland ponds, and rocky coastline. The Atlantic tide runs about 1.5–2 metres (4 ft 11 in–6 ft 7 in). The ocean temperature ranges between 12 and 20° Celsius (54–68° Fahrenheit) in the summer and falls to between 0.5 and 4.5° Celsius (33–40° Fahrenheit) in the winter. The ocean moderates the air temperature over the land year round. The shape of the ocean floor and the numerous ocean currents facilitate a rich diversity of marine life along the Atlantic coastline. The Labrador Current flowing south from the Arctic cools the ocean during the summer months. Offshore, the Gulf Stream, travelling northwest from the Caribbean to the northern Europe warms the ocean waters. The confluence of currents off Nova Scotia brings unusual Arctic and tropical species to St. Margarets Bay. Marine life includes Atlantic bluefin tuna, white-sided and white-beaked dolphins, and pinnipeds. Endangered Atlantic leatherback sea turtles are seen in the waters near shore. Endangered right whales and many other species are found in the waters. The cove was the scene of a youth novel by Bryan Doyle called You Can Pick Me up at Peggy's Cove (1976), which was made into a film directed by Don McBrearty and into a video released by Beacon Films, Inc., in 1982. In 2016 it was announced that a Peggy's Cove–themed resort had opened in Thailand. Sculptor and painter William E. deGarthe lived in Peggy's Cove. A gallery exhibiting his work is open to the public between May 1 and October 31 each year. Outside the gallery, in the William E. deGarthe Provincial Park, is a carved granite outcropping. This 30 m (100 ft) sculpture was carved by deGarthe as "a lasting monument to Nova Scotian fishermen". It depicts 32 fishermen, their wives, and children enveloped by the wings of St Elmo, the patron saint of sailors, as well as the legendary Peggy. On September 2, 1998, Swissair Flight 111 crashed into St. Margaret's Bay with the loss of all 229 aboard. Peggy's Cove became one of the staging areas for First Responders that were involved in the search and rescue response, crash recovery operation, and investigation of the crash. Many of the CCGA volunteers that were first to approach the crash site were privately owned fishing boats that were operating out of Peggy’s Cove and surrounding harbours. In the days following the crash many families and media came to Peggy’s Cove to see the crash site. The residents of Peggy’s Cove rejected the memorial committee’s suggestion of placing a memorial in the community. ^ Peggy's Cove: The Amazing History of a Coastal Village by Lesley Choyce. Over 150 years later DesBarres used his mother's name to rename the bay, Saint Charlotte's Bay. Wikimedia Commons has media related to Peggy's Cove. 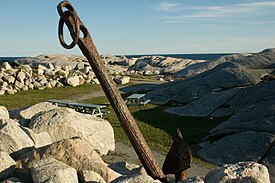 Wikivoyage has a travel guide for Peggys Cove.